Her third self penned album Back To Broken Hill see’s the acclaimed artist move into true singer songwriter territory, still laced with a smattering of jazz influence, in an absolutely beautiful collection of story telling songs. 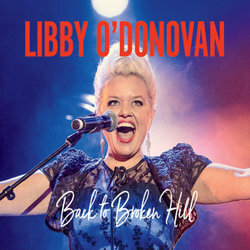 Signing with ABC music for it’s release “Back to Broken Hill” captures the heart, the comedy and the outstanding musical talent that is Libby O’Donovan. Having toured Australia extensively with Australian Country Music legend, Beccy Cole, it's easy to see how O'Donovan has crept into the hearts of country music fans nation-wide over the last few years. Back To Broken Hill is filled with an iconic Australian voice told with impressive vocals, stunning lyrics and outstanding production by Matt Fell, Beccy Cole and O’Donovan. Back To Broken Hill is an extraordinary debut into country music for O'Donovan, painting a breathtakingly gorgeous picture into the lives of regional Australian's. Back To Broken Hill is available through ABC music Friday, July 27. Back To Broken Hill, written by Beccy Cole tells O'Donovan's story about growing up in Broken Hill and is a beautiful country, mid-tempo ballad showcasing O'Donovan's outstanding vocal.